Born in Providence, Rhode Island, to a Cree mother and a French father, Reauna, affectionately known throughout Tremblay's work as "Nana," was sent with her two younger sisters, Bea and Alice, to be raised on her maternal grandparents' farm in Sainte-Maria-de-Saskatchewan, a francophone Catholic enclave of two hundred souls. At the age of ten, amid swaying fields of wheat under the idyllic prairie sky of her loving foster family, Nana is suddenly told by her mother, whom she hasn't seen in five years and who now lives in Montreal, to come "home" and help take care of her new baby brother. So it is that Nana, with her faint recollection of the smell of the sea, embarks alone on an epic journey by train through Regina, Winnipeg, and Ottawa, on which she encounters a dizzying array of strangers and distant relatives, including Ti-Lou, the "she-wolf of Ottawa." To our delight, Michel Tremblay here takes his readers outside Quebec for the first time, on a quintessential North American journey - it is 1913, at a time of industry and adventure, when crossing the continent was an enterprise undertaken by so many, young and old, from myriads of cultures, unimpeded by the abstractly constructed borders and identities that have so fractured our world of today. This, the first in Tremblay's series of "crossings" novels, provides us with the back-story to the characters of his great Chronicles of Plateau Mont-Royal, particularly of his mother, "The Fat Woman Next Door ..." and his maternal grandmother, who, though largely uneducated, was a voracious reader and introduced him to the world of reading and books, including Tintin adventure comics, mass-market novels, and The Inn of the Guardian Angel, which fascinated the young Tremblay with its sections of dramatic dialogue, inspiring the many great plays he would eventually write. 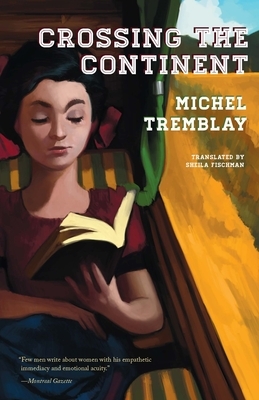 Michel Tremblay: Born in a working-class family in Quebec, novelist and playwright Michel Tremblay was raised in Montreal's Le Plateau neighbourhood. An ardent reader since a young age, Tremblay began to write, in hiding, as a teenager. One of the most produced and the most prominent playwrights in the history of Canadian theatre, Tremblay has received countless prestigious honours and accolades. Because of their charismatic originality, their vibrant character portrayals and the profound vision they embody, Tremblay's dramatic, literary and autobiographical works have long enjoyed remarkable international popularity; his plays have been adapted and translated into dozens of languages and have achieved huge success in Europe, the Americas and the Middle East. Of his own work, Tremblay has said, I know what I want in the theatre. I want a real political theatre, but I know that political theatre is dull. I write fables." Tremblay's novel The Fat Woman Next Door Is Pregnant was long-listed for the CBC Canada Reads program in both 2002 and 2003. In 2004, he appeared as a guest of honour at the Calgary WordFest. In January and February of 2005, the Manitoba Theatre Centre presented TremblayFest: a two-week extravaganza in which fifteen of Tremblay's stage plays were performed by sixteen different theatre companies. In April 2006--as Montreal concluded its term as World Book Capital--Tremblay was the recipient of the Blue Metropolis International Literary Grand Prix, awarded annually in recognition of a lifetime of literary achievement to a writer of international stature and accomplishment. Sheila Fischman: Sheila Fischman is a member of the Order of Canada and has a doctorate from the University of Waterloo. In 1999, she received an honourary doctorate from the University of Ottawa. A two-time Governor General's Award winner, Fischman has translated from French to English more than a hundred novels by such prominent Quebec writers as Michel Tremblay, Jacques Poulin, Anne Hebert, Francois Gravel, Marie-Claire Blais and Roch Carrier. She is a founding member of the Literary Translators' Association of Canada and has also been a book columnist for the Globe and Mail and the Montreal Gazette. In 2008, Fischman was awarded the prestigious Molson Prize for her outstanding contributions to Canadian literature.Originally from Saskatchewan, Fischman currently resides in Montreal.